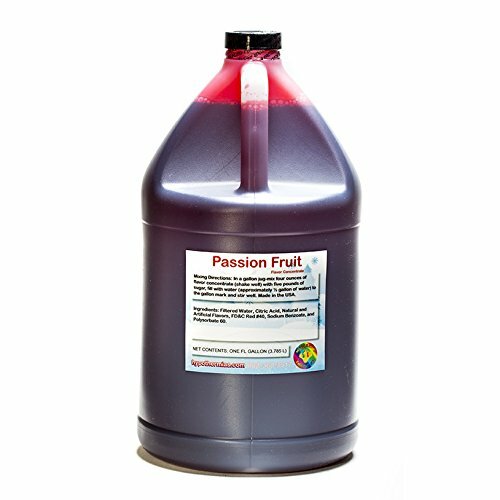 Delicious passion fruit shaved ice or sno cone flavor concentrate. Made in the USA. Very easy to mix: To make a gallon of syrup add 5 pounds of sugar, 4 ounce of flavor concentrate, add water to to the gallon mark stir well, serve. To extend the life of the syrups you can add optional preservatives (citric acid, sodium benozate). Each gallon of concentrate will make 32 gallons of syrup when mixed. This is professional, true to taste shaved ice flavor. Life of concentrate 1-2 years. Self life of concentrate 1-2 year (not mixed syrups). If you have any questions about this product by Hypothermias, contact us by completing and submitting the form below. If you are looking for a specif part number, please include it with your message.